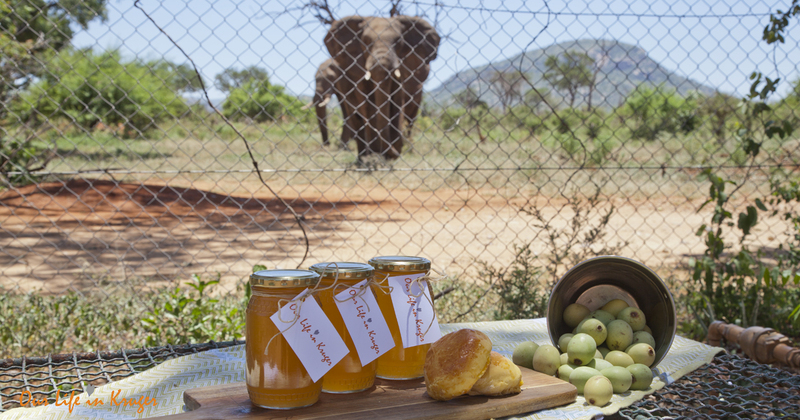 The Fine Art of Making Marula Jelly - Recipe included! I saw such a great movie this past weekend. It is called ‘Julie & Julia’ (available on Netflix) and it is based on a true story; A story about Julie Powell, who blogs about cooking her way through Julia Child’s cookbook “The fine art of French Cooking”. 524 recipes in 365 days. Her blog becomes a massive hit and eventually gets published as a book and made into a movie. You see my attraction to this whole story…? Ah, one can only hope;-)) Anyway, this movie and title of Julia Child’s cookbook were the inspiration for the title of my new blog: The fine art of making Marula Jelly. Our new garden at Malelane Gate is big. Very big! I estimate it roughly to be about 600 m2. And it has some stunning mature trees in it. A couple of Jackal berry’s, a Haak and Steek (poor Jack stepped into one of those long thorns the other day… Eina! ), A Fever Tree and an Apple Leaf tree and then there are three Marula Trees. The two trees at our garage are carrying a lot of fruit at the moment. All day long we hear the ‘plok-plok’ of the fruit falling on the roof of our garage. Did you know that there are male and female Marula trees? Only the female trees carry fruit. According to Marula.org.za, a single Marula tree can carry up to 500 kilograms of fruit! Our two female trees are definitely producing a lot! I will be making jelly till the cows come home! 😉 That is if the elephants don’t get to it because elephants looooove Marula fruit! So far though, since we have been back from Holland the elephants have left our garden, veggies and Marula trees alone. We did have two young bulls hang around our front gate for a whole afternoon. It kind of looked like they were devising a plan to come and harvest some of the fruit and vegetables inside. I had a bit of a chat with the one youngster. In my mind, I had already said goodbye to my vegetable garden, but the next morning everything was still standing! Dankie tog! Sal, the lovely lady who has been reading my blog from day one and that was the first person to ever leave me a comment, suggested I make some Marula Jelly. She even sent me a recipe! Thank you, Sal! For the last couple of days, I have been picking up the fallen Marula fruits every morning. I get about a bucket full each day! So, here the recipe and my first attempt to make my own Kruger Marula Jelly! Collect your Marula fruit and give them a good wash. Then make a cut in each fruit and let them soak in water overnight. Make sure you add some of the green fruits too. They have more pectin and that helps the jam to set. Strain the contents of the pot through a cheesecloth. I didn’t have cheesecloth so I used one of Jack’s old muslin cloths. I suppose any clean cloth will do. The juice will almost look like fresh orange juice! Wash out your pot and measure the juice. Then pour it back into the clean pot. Add white sugar: 1 cup of sugar for one cup of juice. Also, add the juice of one lemon for each liter of Marula juice. This mixture needs to boil rapidly for about 20 minutes until it reaches 105 degrees Celsius. I have a jam or sugar thermometer, so I used that. I had quite a large amount of juice to boil, so it took a bit longer than the recipe prescribes: about 35 minutes. If you do not have a thermometer, you can check by putting a few drops on a cold saucer. Allow it to cool and then push it with your finger to see if it wrinkles. Make sure you have enough space in your pot! The jam bubbles easily and might spill out. It needs to keep bubbling. Bottle the jelly in sterilized bottles, then leave to cool upside down, label and store them! This is the first time I tried to make a jelly or jam and even though it is a bit time-consuming, I found it relatively easy. A lovely sweetish smell filled our kitchen and the end result tastes great! Sweet and a bit tart. So there you have it: The Fine Art of Making Marula Jelly. A bit of a different blog post than usual, but since quite a few people asked me for the recipe, I thought I would share. And I have to say I really enjoyed myself making this jelly with fresh Marula fruit from our garden, grown in real Kruger soil! Yummy! A scone with Marula Jelly! Tales of the Trailcam – Marula Season! Ooo I would love a jar of you jelly AND I have a daughter who lives in Komati Verna v Zyl. Done! One of the jars of Marula jam is yours! Your jelly looks wonderful. Whenever I’m in the park I buy jars of the amarula and chilli jelly they sell in the shops. My family is addicted to it. We eat it with cheese, roast meats, in fact anything. You could try making it as well. Thanks, Stephanie! You were one of the first four people to comment, so please contact me for your bottle of jelly! I would also like to taste, will be in your area end Feb! I grew up near Letsitele as a small child and could actually smell the marula fruit as you were descibing your cooking process. Was able to visit Kruger Park last year for a few days, heaven. Now living in Perth, Australia 🇦🇺. Good morning Linda, love this blog 😉 Next time you make pork chops, put a blob of marula jelly on the side, yummy 😋 Crystal loves this jelly, and yours looks fabulous, so nice and clear. Marula Jelly is unique and delicious! Have you considered selling it to guests in the camp? I recall many years ago while staying at Lower Sabie the Ranger’s wife came around in the evening taking orders for cinnamon panekoek. She must have made a small fortune. Many many years ago a rangers wife also made cinnamon pancakes in Letaba. They were wonderful. Yummy. I was in Skukuza last weekend. 😩. Good morning, love reading your blog and thank you for sharing your day to day life with us all. It is wonderful to see your first attempt of making marula jam come out so well and yummy. Hi Linda, WOW how wonderful is that! Do you eat Tomato Jam? That’s the only jam I have tried to make and apparently it nice. I don’t eat it so I am not sure how if it’s any good. HAHA. Ok so I will be at Berg en Dal from the 11th of Feb so I will be passing your house! Let me know if you eat Tomato Jam then I can bring you a bottle in exchange for a bottle of Marula Jelly! If you don’t let me know what you would like and we can make a trade! I’ll be coming from Pretoria, so let me know! Happy cooking, don’t get burned. Sugar burns are the worst! and if you do cold water and aloe cream works best. if you don’t have aloe cream use toothpaste! Lekker so you’ll be at B&D for a bit. Just visiting with family or on HR duty? We will think of a ‘trade’ no worries. Just Holiday at B&D till 14th then to Pretoriuskop till 17th. Getting spoiled! My Mom and Dad is taking me to Kruger for the Week for my 40th Birthday on 13 Feb! So it’s just relaxing and no Work, well some work, as I need to work with my daughter each day to keep up her school work as she will be missing a week of school and I need to put some study time in as well as I am busy with a Diploma. But we will still have enough time to relax. It will be great to meet you! To be in the park for your 40th is the best present ever!!! Enjoy! We will see you around that time! Looking forward to it! I so envy you having a macula tree. Brings back awesome summer holidays on my uncles farm in Zimbabwe. As kids we loved eating the actual fruit. When travelling to Nelspruit or Kruger on holiday we always stop at Millys and buy marula jam. Addictive stuff lol. Love your Blog, takes me to Kruger on holiday every time I read it. Have a lovely day. How I wish I could come and collect Marula jelly !! I would give almost anything to be in the Kruger again ! I enjoy your blog so very much ! Unfortunately we live in Cape Town and its very expensive these days to get up to the Lowveld ! Have been many times in the past and it is my favourite place on earth. Aaah! One can only dream ! So I love seeing and hearing your life in Kruger. Thank you very much !! My daughter and I will be coming in through the Malelane gate on the 10th March. It would be great to be able to visit and say hello and get a feel for your surroundings that you write about. Love reading your blogs. Hi Allan, You are welcome to pop in and say howzit! See you then! Wow Linda you are adapting to kruger life well. You can start your own ‘cooking blog from kruger’ as well. Lol. I can smell the jelly all the way here in Holland. Great job. It looks delicious. Live the photo of the jam with the ellies in the background. I will come and say ‘hoi’ in February /March when I visit kruger. We’ll be in Kruger in May. I’d love meet you, and buy a jar of marula jelly from you. 🙂 And If you’d need something from Holland (not so big, it needs to fit in he suitcase) we’re more than willing to bring it. Wonderful Blog as usual. I love making jams and jellies. I would love to try your Marula Jelly. We will be in Kruger at the end of March, coming in at Malelane gate and staying at Pretoriuskop. I cannot wait and am already counting the days. I would love to buy a bottle or two from you if you are prepared to sell some. As always I look forward to your blogs and cannot wait for the next one. Sounds yummy 😋 and how special to see Ellie’s at your gate. I will be in Kruger from the 29th of Jan, loving the blog…. Ai hoe lekker klink jou jellie 😁. Ons bly nou in Engeland en hier is so baie “Blackberries”. Ons bly in ‘n baie klein Village en die heinings om die plase het baie Blackberry bosse so ons pluk en eet lekker. Ek het verlede jaar Blackberry konfyt gemaak en dit was regtig lekker. Lekker kook en Geniet die warm weer vir ons 😉. I cannot tell you how excited I am to read your blog everytime you post something. One of our favourite places is the Kruger Park and the lowveld and I love reading about your life in Kruger. What a wonderful place for your kids to grow up in. Your Marula Jelly looks amazing and I hope I get to taste some day soon when we pass that way again. Geniet ervan zoals wij van je blogs genieten!! Love your blog, we’re from the UK, lucky enough to visit Kruger each year. My mum (then me) made crabapple jelly yearly, we’d strain it through a leg of a pair of tights… looked like a very fat leg hanging. On a poor fruit year we squeezed the “leg” to get every last drop out. Ended with a cloudy jelly not the lovely light orange clear one, but kept and tasted just as good. Good luck with rest of jelly making. Love Marula Jelly..well done for making it,and in such big quantities! What’s next ? There seems to be no end to your talents !!! I am flying to Joburg tomorrow ( from London) to spend some time with my hubby Hannes who is flying for a southafrican company,and I am hoping to get to Krueger for a few days during my stay. Hope that the Ellies keep avoiding your garden..good luck.. Joking aside, please do not hesitate to let me know if you need something from Belgium (gouda, speculoos, …). What I would give to receive a jar of your Marula Jelly I always read your blogs and it takes me back to the best place on earth…. Kruger. We used to visit every year from England but have not been for two years now as my husband is not too well. Nevertheless we had so many fabulous holidays in the Kruger with wonderful memories nobody can take away. Please carry on with your lovely blogs I so enjoy them. You can each come collect a jar of Marula Jelly at our house at the gate!! Baie dankie Linda! Will be in touch! I would give anything to be sitting in your kitchen right now eating that scone heaped with Marula Jelly, together and endless cups of tea. Another fabulous blog Linda. You certainly have many talents. Thank you for sharing with us. PS: I’m going to raid my kitchen now to see what I can find to eat. Wow – this blog certainly brought on the comments!!! You certainly don’t waste any time . . . . 🙂 Loved it! Your pics are so beautifully posed (not so easy to make food look really appealing in a pic) and really add to the blog. The jelly looks so pretty in the jars and the labels are fabulous. Thank you very much for saving me a jar Linda; my sister in the UK who makes masses of jams and jellies from all the local berries assures me it will keep . We are coming to Kruger next May so maybe you could save it for then? So look forward to that – I will understand if its pinched by a vervet or a roving elephant trunk through the window though!!! I didn’t try too hard – 11,000 kms and the Indian Ocean make it a bit difficult. Hope the takers enjoy it as much as you seem to have enjoyed making it. Linda, Now all we need is a male and female Marula tree in our gardens. thank you. Love your stories. I have lived in SA all my life but have never been to Kruger. Definitely on list of things to do. Well done with your Marula jelly. Great when an experiment works out. Keep up the good work and the lovely story telling from your fascinating life. Kind regards Eleanor. I would love to come and pick it up in a park. But it is little to far for me unfortunately. I am sure it is really good. Thank you so much for sharing the recipe – your jelly looks super yummy. Wish I lived closer … if you make more, please save me a bottle and I will buy it from you in August. Just love your blog, thanks for sharing. Well done Linda, you will soon be the Marula jam queen of the bushveld! What a wonderful idea. Imagine if you sold it at some of the camp shops. Marula jelly made from Kruger Marula Berries. That is awesome. Enjoyed this so much. Glad you enjoyed my post, Brigitha! It is quite a process to become a supplier for the park, so, for now, I’ll try and sell at a local farmers market! Greetings from the UK! Loved our yearly trips to Kruger as a family where we would buy Marula jelly by the box full for a years supply! Love it on hot toast! I just made myself and Jack a toasted goats cheese and Marula Jelly sandwich. Also delish! Bit far at the moment to come for your jelly,but I’m sure In February Mohlabetsi will have some of there’s,love your blog,takes me back to the Bush on a grey and wet UK day,thanks.